It’s no secret that Chicago area residents consume a great quantity of wine, as if Lake Michigan were some North American version of the Mediterranean (albeit with blizzards instead of balmy winter days). With wine super stores and myriad smaller shops sprinkled throughout the area, Chicagoans seem to consume wine as if we’d grown up in Sicily or Provence. But perhaps there’s something else going on here. Maybe Chicagoans—ever mindful of the joys of food and beverage—are simply discovering the manifold pleasures of the diverse and infinitely pleasure-inducing world of wine. With Americans on pace to exceed the French as the number one quaffers of vino, Chicagoans are riding the crest of a rising tide of wine drinkers in the U.S. One by one, we’ve discovered the seemingly endless offerings of the world’s unique and arcane offerings, from prosecco and ice wine, to pinot noir and barolo. So perhaps it’s not surprising that we’re pursuing with equal zeal the storied and rewarding pastime of wine collecting. According to Kevin Mohally of Northbrook’s Knightsbridge Wine Shoppe, wine collecting has nearly doubled in the past few years. More interesting is the diversity of recent collectors. “Quite a few kids coming out of college are now interested in collecting,” Mohally observes. And according to Robert Canales of Mainstreet Wine Shop in Countryside, an established corp of collectors regularly visits his store in Countryside, seeking traditional collecting wines, as well as über-rare selections in which the shop specializes. Canales’ customers routinely purchase wines they intend to uncork on some future date when they celebrate an anniversary, a child’s graduation, retirement, or the birth of a child or grandchild. For hundreds of years, wine drinkers have purchased barrels or cases of Madeira, port or wine which is then presented to children on auspicious birthdays or on their weddings. While this practice continues, today’s collectors are more likely to purchase wine for their own use or to help celebrate some future occasion. Wine enthusiasts wax ecstatic about their collections, patiently awaiting the uncorking of what will likely be superb bottles of, brunellos, white and red burgundies, riojas, California cabernets, ports, madeiras, rieslings, sauternes and bordeaux—all ideal wines for aging. To figure out which wines to acquire, would-be collectors should assess their tastes, sampling wines and talking to knowledgeable wine staff. Both Canales and Mohally stress that pleasure from wine collecting can only be derived by purchasing what you like—not whatever receives the highest points from Wine Spectator. But once you begin collecting, how do you know when to drink the wines you’ve assembled? The probable date for maturation can be determined by finding out how long a particular wine typically ages, following advice from cognoscenti at your local wine store, reading wine newsletters and magazines or at www.cellartracker.com. If you’ve bought a case or more, another approach is to sample a bottle each year beginning with the first year the wine might be aged to perfection. This provides the advantage of allowing a collector to taste the wine as its profile develops and matures. And aren’t we all looking for a good excuse to drink a bottle of wine, anyway? Oak Park resident Stacy Lunardini, 41, started collecting a few years ago when she and husband Marc traded their condominium for a bungalow. Their new house has plenty of storage space, including a cool, dark basement which is currently being renovated to include a basic wine cellar. The couple collects bottles on their travels to Europe and California, but before settling them down for a long nap, Stacy scribbles drinking notes as well as the expected date of maturation on small wire tabs which are then attached to each bottle’s neck. As with pets, certain wines demand specific care, though the requirements fall infinitely short of those required for say, dogs. When collecting and aging wines, a few guidelines should be considered. Optimally, wines should be stored in a cool, dark area with a temperature range from 58 to 65 degrees and no more than a two-degree fluctuation in a day. An acceptable temperature would range from 65 to 75 degrees, with no more than a four-degree fluctuation in any given day. Subject the wine to a 90 degree day or more than a ten degree temperature difference in a day and the bottle’s contents might at best be slightly compromised and at worst be better suited for cooking. While wines hardly require one of those labyrinthine, cobweb-draped cellars seen in Masterpiece Theater episodes, they accomplish their best aging when it’s cool, dark and just slightly damp. If some range in temperature is permissible, setting bottles upright is strictly verboten. Rapid oxidization of wine can do considerable damage and by storing bottles on their sides, corks remain in contact with the wine and don’t pull away from the glass, thus admitting just the right amount of oxygen. For apartment or condo dwellers, a retrofitted cellar might be impossible to pursue—and even if you could, all those wines aging in a shared storage room, perfuming the air with tempting, heady scents, might be asking for trouble. If you start collecting and find yourself so impassioned with your new-found hobby that you run out of space, most areas offer wine storage facilities—check with your local wine store. 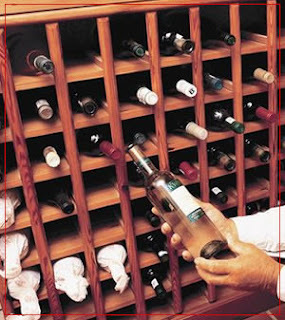 For smaller caches, a climate-controlled wine storage chest can be had from specialty food, wine and appliance stores. If John Stuart Blackie’s assertion that “Wine is the drink of the gods” is true, then collecting wines assures that you’ve always got something on hand to serve even the most exalted of visitors. And if a deity doesn’t arrive, then you can ceremoniously blow the dust off a bottle and serve it to family or friends—or better yet, enjoy it yourself.